1871-CC SEATED LIBERTY DOLLAR $1 PCGS AU DETAILS, VERY RARE! AU50 PG = $21,000! 1848 SEATED LIBERTY DOLLAR PCGS XF-45 SCARCE DATE! 1871 50C Liberty Seated Half Dollar PCGS PR 62 Proof Looks Better ! 1871-CC Seated Liberty Half Dollar 50C Coin - Certified NGC XF Details (EF)! 1871-S Seated Liberty Half Dollar 50C - Certified ANACS XF45 Detail - Rare Coin! 1871 Seated Liberty Half Dollar 50C - PCGS Uncirculated Details (MS BU UNC)! 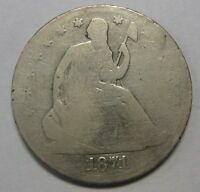 1871 Seated Liberty Half Dollar 50C Coin - Certified ANACS AU55 Details!